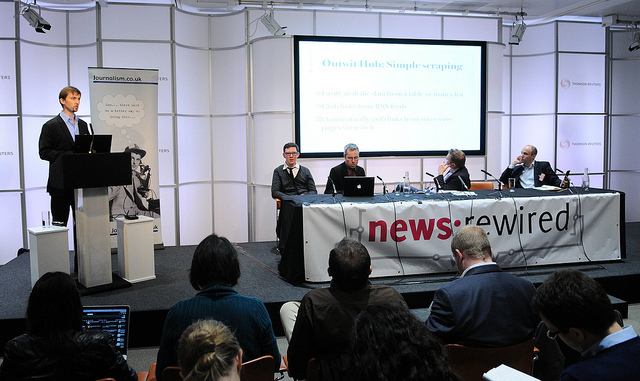 Here are the presentations from Session 1A – ‘The data journalism toolkit’, at last week’s news:rewired conference. Kevin Anderson, data journalism trainer and digital strategist; James Ball, data journalist, Guardian investigations team ; Martin Stabe, interactive producer, FT.com. Simon Rogers; editor, Guardian datablog and datastore. Moderated by David Hayward, head of journalism programme, BBC College of Journalism. View more presentations from joelmgunter. Where: Reuters UK, Canary Wharf (30 S Colonnade, London E14 5EP). #newsrw: Win a Flip Ultra HD camcorder!